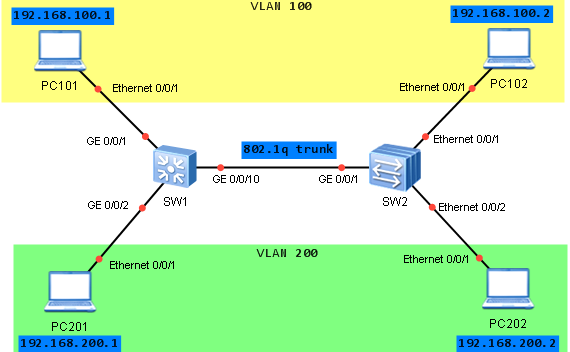 How to configure VLANIF (VLAN interface or simply SVI). Let’s assume that we want to configure two switches, which are connected via Ethernet link. Both switches have PCs connected to them. We want to allow PC101 to be able to reach PC102 and PC201 to be able to reach PC202.To do so, we need to add two different VLANs, configure Ethernet Trunk between switches and add PCs to the correct VLAN.